the Keitai Goddess : OMG! Yum! 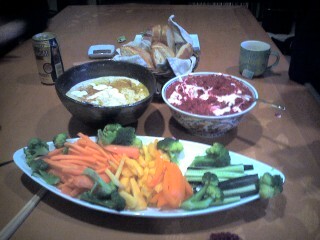 Tod and the Ashman created this afternoon feast of beetroot dip, tahini dip and vegies. Keeping Ellie and I fed during our massive sewing project. It was but let me tell you that an excess of beetroot dip does interesting things to your next day “movements”. TMI?